This is an interesting test. How accurately do you see color? Try your hand at arranging the colors in a gradient from the beginning color to the end color. See how you score. Click HERE to read about and take the test. I scored a 7, and Jim scored an 11. I wonder if our exposure to art helps us see color. I had the most trouble in the blues. I haven’t tried it on a different monitor (Jim tried it on the tv and got a 20 and then on the laptop and got the 11 – did he do better because of the monitor?) It’s an interesting 10 minutes, anyway. Have fun! Feel free to leave a comment and let me know your score! Having trouble with blue tones like me? Maybe a painting in blue would be a good exercise. There are several options for giving your acrylic paintings a final protective coating and a nice even surface. Acrylic gloss medium will add depth to your colors and give your acrylic painting an oil like appearance. It also provides a protective coating to your finished painting. Diluted to 50%, it can also be used to fix charcoal and pastel. May also be used as a collage adhesive. Acrylic matte medium does not contain the same hardeners as acrylic gloss medium and should not be used as a final varnish. In addition, matte mediums can cause clouding when used thickly. Acrylic varnish, applied to your finished painting seals the surface and protects against damage and dirt. It can be reversed with mineral spirits. Acrylic varnish comes in gloss and matte finishes. Gloss varnish leaves a deep shine on the painting, while matte varnish gives a semi-gloss surface. Matte varnish should not be used thickly. For multiple coats, apply gloss on undercoats and apply matte as the final coat. 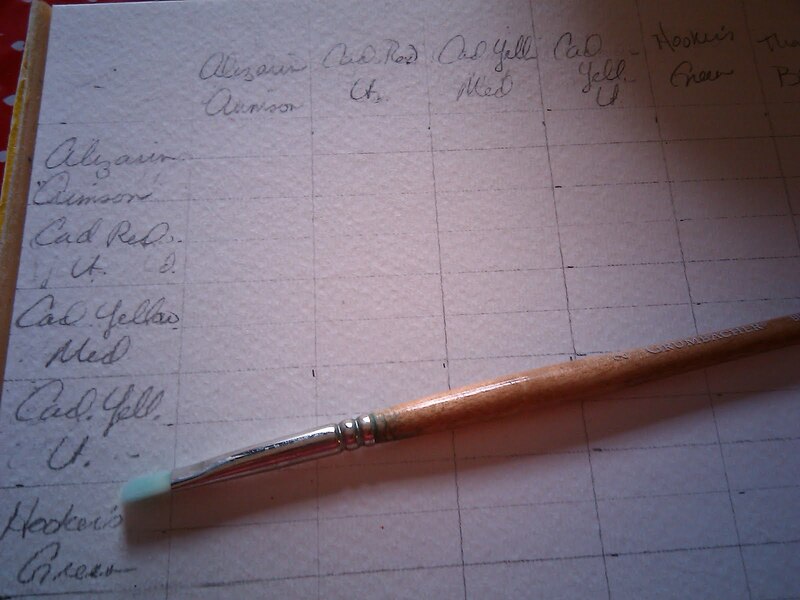 To apply varnishes, use a soft wide brush and long edge to edge brush strokes. Do not shake the bottle, as that will introduce air bubbles to the liquid. Use thin coats and allow to dry between coats. Do not build layers of matte varnish or medium, as it tends to cloud. Instead, build layers of gloss medium or gloss varnish and finish with a layer of matte. We had a great conversation at the beginning of class tonight. Brenda, Joyce, and Sarah are all beginning to look at the world and other art with a more critical eye. There was some discussion about the ability to create believable clouds with acrylic rather than oil. Here are some images that show the beautiful skies you can create with either medium. Here is a great page of examples of clouds in art. These are all oil paintings. Notice how different each painting is and how the artists use different approaches to clouds to help create different atmospheres in each painting. Check out this video that shows an artist painting clouds in acrylic. Take special note of how he works with varying values of the same hue. Also, notice how he applies a bit of paint and scumbles it in until the brush needs more paint. Here is a page that has a nice tutorial for a sunset in acrylics. I think it’s a nice image. He also offers some drawing tutorials. I find his still life tutorial lacking, in that it is just a line drawing without dealing with light. However, his perspective tutorials are a good beginning introduction to perspective. 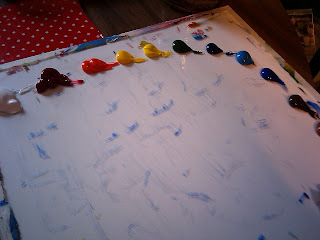 On a piece of 9×12 watercolor paper (you can use a canvas board or canvas) lay out a grid with all of your colors along the top and along the side. 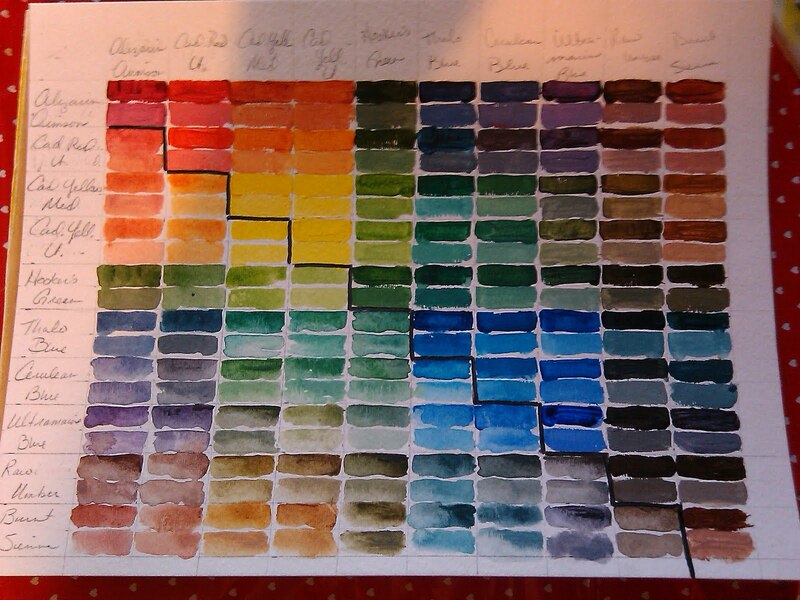 I have divided the horizontal rows in half so that I can apply pure color and the tint of the color. For each pair (e.g. 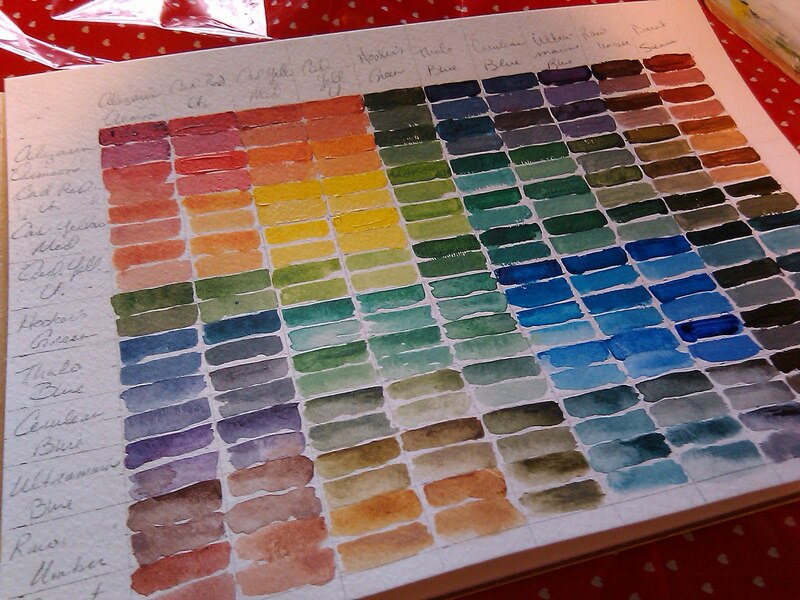 Alizarin + Cad Yellow Light), mix the two and paint the top box with the pure mixture. I then add white to the mixture and paint the bottom box. 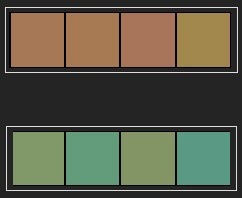 Since I put all the colors along both the top and the side, I end up with two instances of each combo (e.g. Alizarin + Cad Yellow Light, and Cad Yellow Light + Alizarin). I used one set for opaque color, then I did a wash on the other set. You can see the line where the two types meet.